Area S-18 is the eighteenth course of Rainbow Summit and the ninety-first course overall in Mario vs. Donkey Kong: Mini-Land Mayhem!. The Mini Marios all begin at or near the bottom right corner, with the exit door on the top left. In order to reach it, they must simply be guided via a series of Red Girders and Blockers to it, while watching out for the Thwomps. The M-Token is located at the top right, in an alcove between two Blockers. 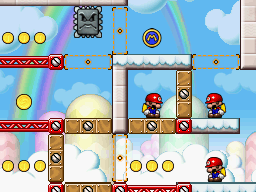 To collect it, a Mini Mario must follow to it from the left, while making sure the right Thwomp is contained via another set of Blockers. The Mini Mario Card is located at the middle left, just below the exit door. A Mini Mario must simply use Red Girder ramps to reach it.